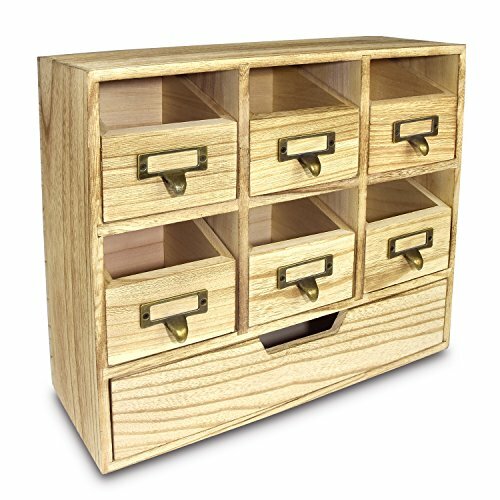 It's not fancy but it is functional, this wooden tabletop organizer is perfect for storing . Perfect for the space you can find yourself putting random things all of the time as a "catch all"! Comes in six 3 7/8" height drawers and one big bottom drawer is great for storing and classify various items. ☑ Perfect for storing and organizing craft, office, makeup supplies, pencils and pens, notepads and miscellaneous. Stuff fits in the bottom drawer and the top slide-out drawers hold paper clips, postit note pads, stamps, incidentals, keys, extra cash, watches and anything else that would get lost and to keep all of that type of stuff as a "catch all"!.